Reproduction in bee-eaters depends on the species. 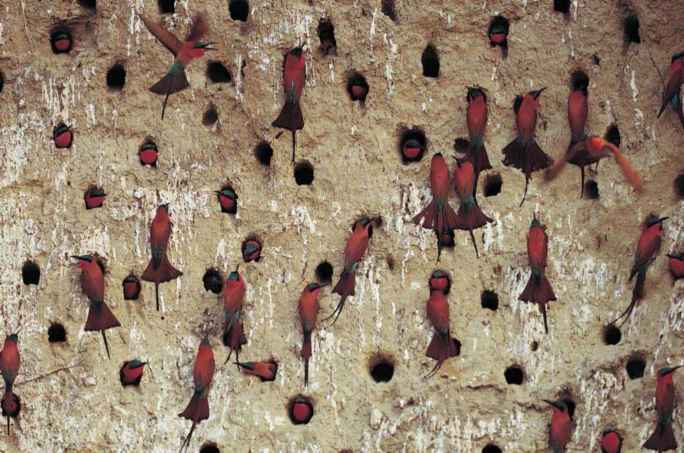 Some have solitary nesting by unaided pairs, while others have extremely dense colonies with complex social structures and cooperative breeding. Cooperative breeding, which involves assistance by non-breeding adults, may be the rule rather than the exception. 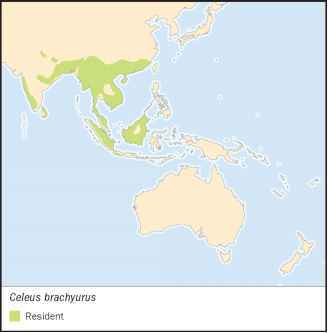 Seventeen species are known or suspected to be cooperative breeders. 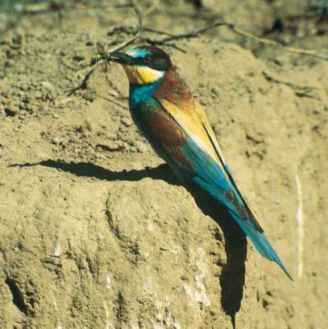 All bee-eaters dig their own nesting burrows into soil or sand, and burrows may be 1.5-9 ft (0.5-3 m) in length, depending on the species and soil type. Thirteen species dig nests into nearly flat ground or into banks along rivers, irrigation ditches, erosion gullies, and even into roofs of aard-vark or warthog dens. The family structure and helping behaviors of the white-fronted bee-eater were studied in great detail and will serve as a complex example of cooperative breeding. The basic elements likely apply to all bee-eater species with cooperative breeding, although in some species family groups may be less complex. Helpers are often associated with all aspects of the reproductive attempt, from helping to dig the nesting burrow to incubating eggs and feeding nestlings. The most important function of helpers is in bringing food to the nestlings and recently fledged offspring. In Kenya, one helper could nearly double the number of offspring produced by a pair. Thus the ability to attract a helper could make a significant contribution to the reproductive output of a breeder. their nesting attempt, they may become helpers at the nest of a son or grandson. In addition to benefits that a helper gains by increasing the production of close relatives, sometimes a bit of selfish reproduction is possible as well. It is common for a young female helper, nearly always the daughter of the breeding pair, to slip one of her own eggs into the nest of her parents.